Overall Print Size: 23¾" x 36"
In 1940, long before American entry into World War II, 71 Eagle Squadron, the first Royal Air Force Eagle Squadron was created. The squadron was composed of volunteer American pilots who fought for England against the German Luftwaffe. On 27 August 1941, 71 Eagle Squadron pilot Flight Officer William Dunn became the first American ace of World War II. In September 1942 all three Eagle Squadrons became the 4th Fighter Group, with 71 Eagle Squadron becoming the 334th Fighter Squadron. The Group became the highest scoring group or wing in Air Force history with 1,016 kills. The highest scoring squadron in the Group was the 334th with 395 kills and 34 aces. In the Korean War 334th pilot Major James Jabara became the world’s first all jet ace. Also in the Korean War the only Medal of Honor recipient in 4th Fighter Wing history was 334th Fighter Squadron pilot Lt Colonel George Davis. Lt Colonel Gus Grissom, one of the original seven Mercury astronauts, completed 100 combat missions with the 334th in the Korean War. The 334th Fighter Squadron had 142 kills and 8 aces in the Korean War. In the 1960s and 70s the 334th deployed to Thailand several times to support the war in Vietnam. Since 1994, the 334th Fighter Squadron has trained F-15E Strike Eagle fighter pilots and weapons systems officers (WSO) to accomplish air-to-ground, air-to-air, strategic attack, and deep interdiction missions. 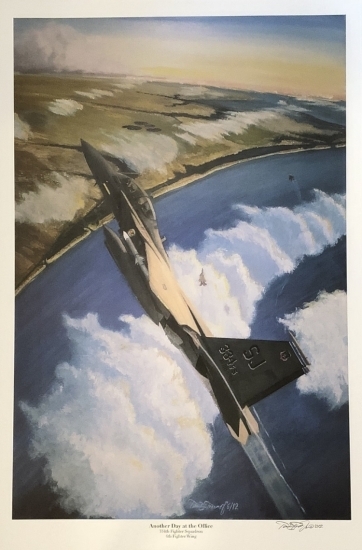 Published in 2012, the magnificent "ANOTHER DAY AT THE OFFICE" portrays a 334th Fighter Squadron F-15E Strike Eagle flying over the coast of North Carolina, where Seymour Johnson Air Force Base, home of the 4th Fighter Wing, is located. For the gallant men and women flying this extraordinary aircraft it is just, "Another Day at the Office." Individually signed and numbered by North Carolina artist Tim Treanor.